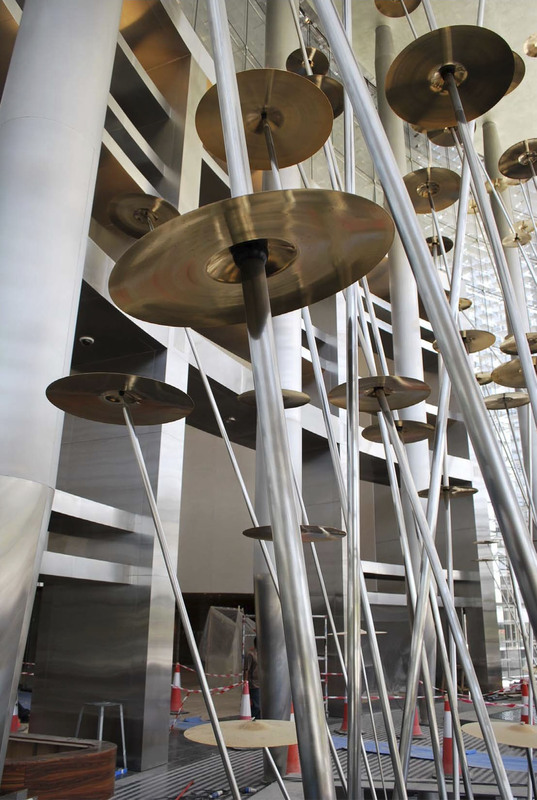 Jaume Plensa’s World Voices is composed of 196 cymbals that represent the 196 countries of the world – symbolic to Burj Khalifa being a collaboration of people from across the globe and befitting its global iconic status. 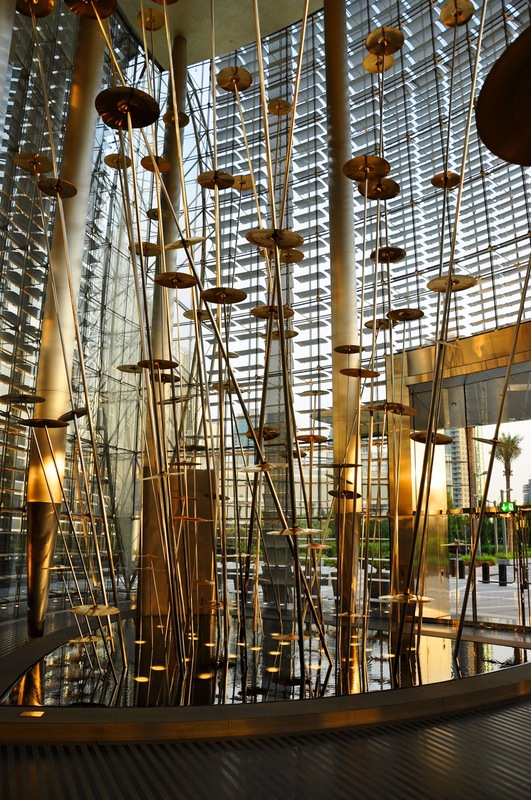 The Residential Lobby area of Burj Khalifa will be a meeting place of diverse cultures and nationalities – a metaphor of the diversity of our global society, World Voices is homage to this diversity and a celebration of life. 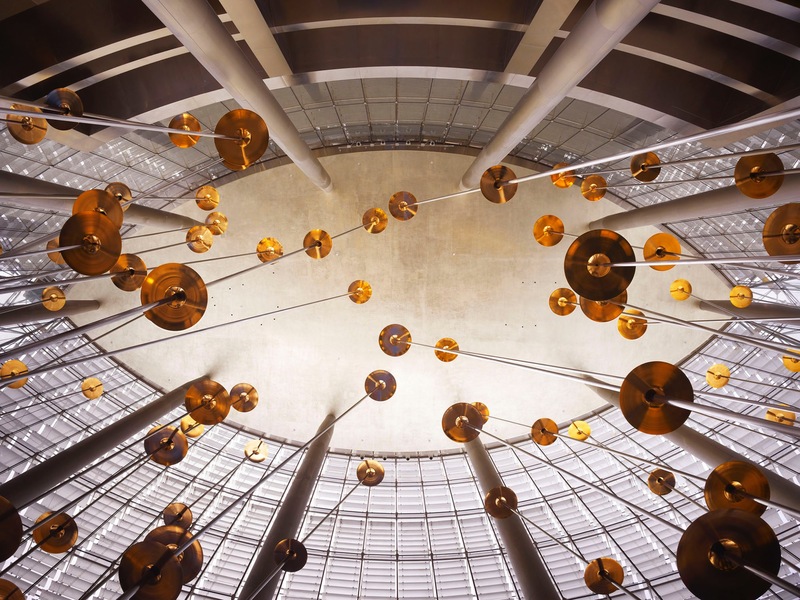 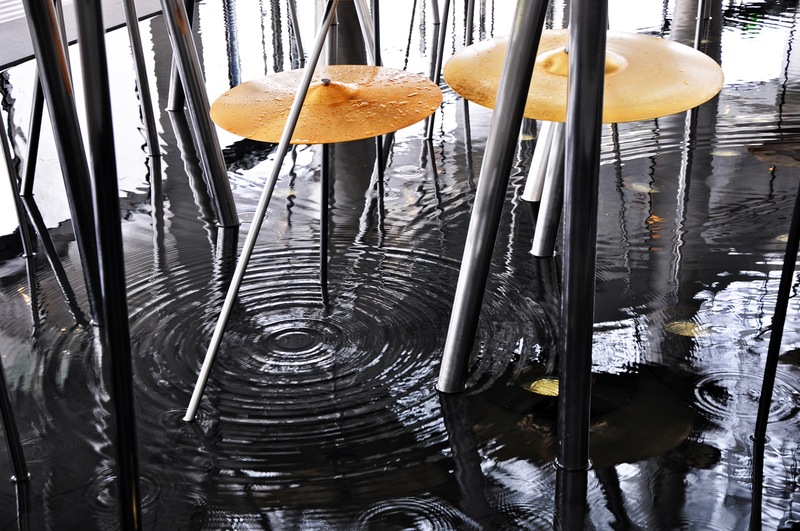 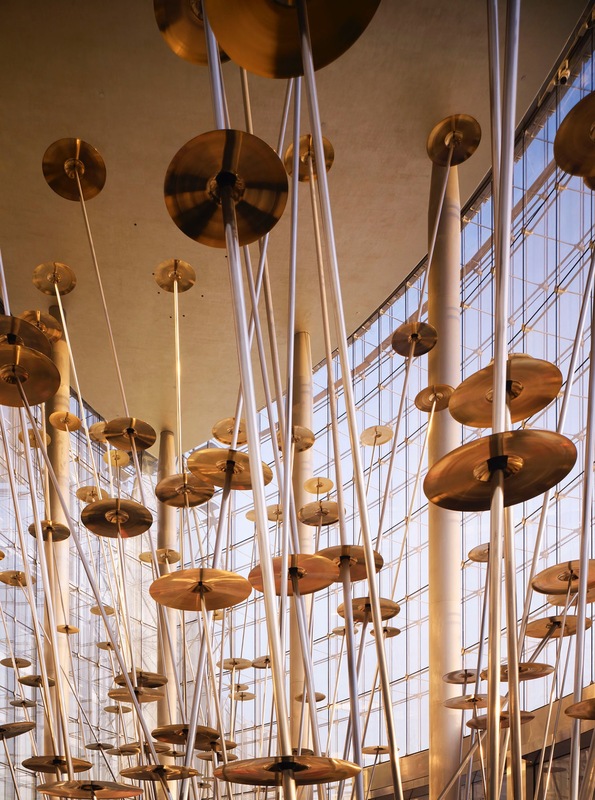 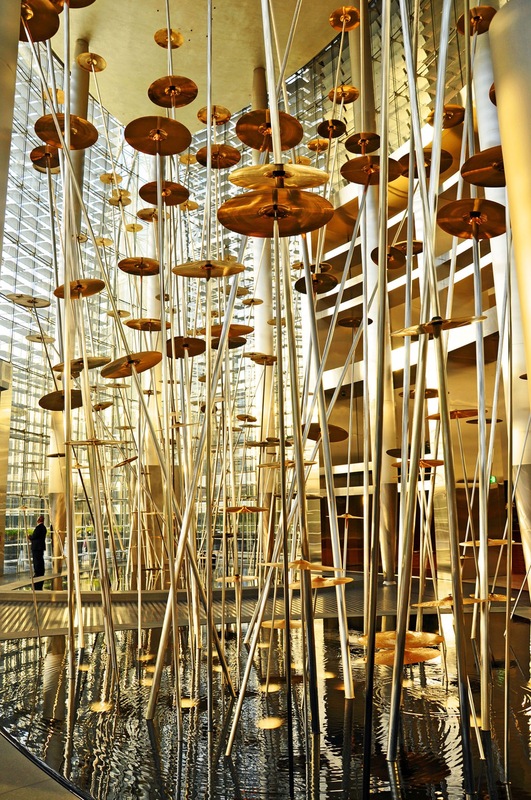 Cast in bronze and brass alloy, finished by hand and plated with 18-carat gold, the cymbals are horizontally suspended on the titanium rods anchored at the bottom of two pools, symbolizing reeds in a lake. 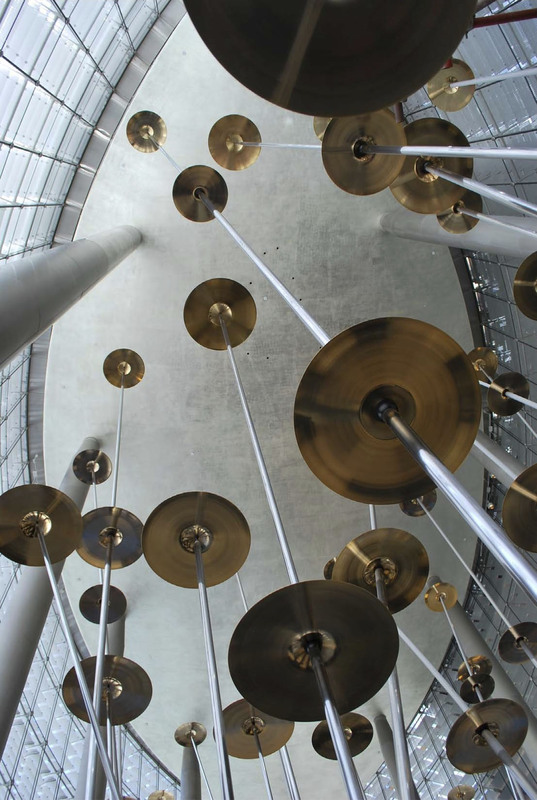 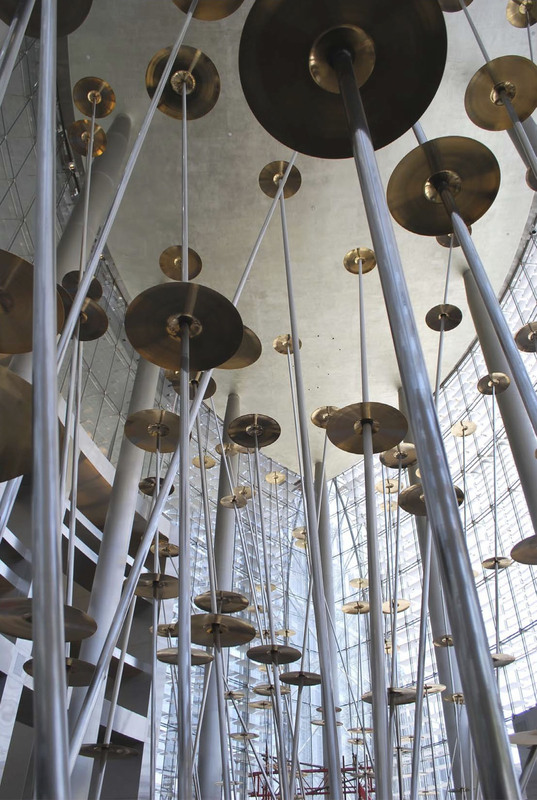 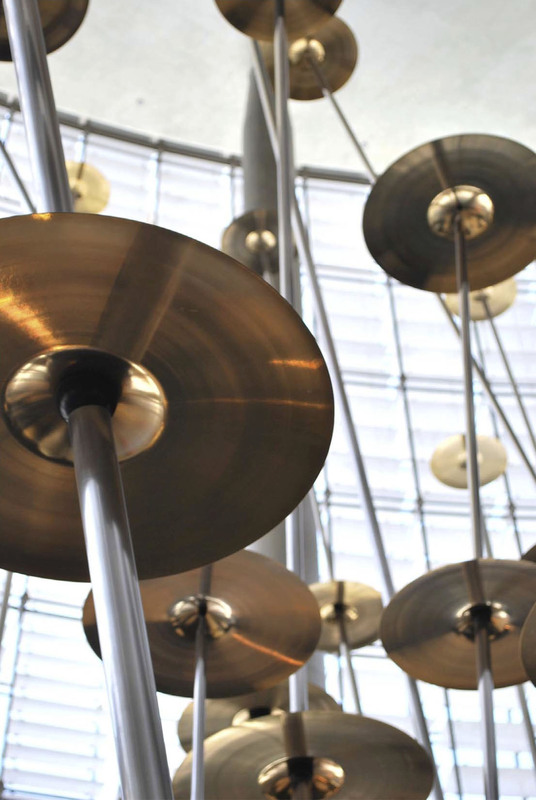 In the ceiling above are 18 droplet nozzles, 9 over each pool, that are choreographed so when the droplets fall on the cymbals a distinct timbre is created as they are struck, which the artist compares to the sound of water falling on leaves. 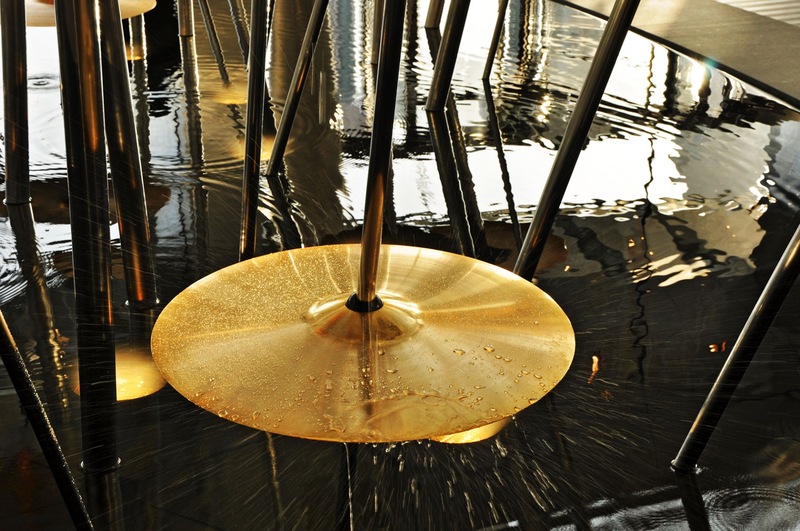 To contribute to the ambience and calming affects of the naturalistic rhythm is the soft lighting from the pool lights and the reflections dancing on the ripples. 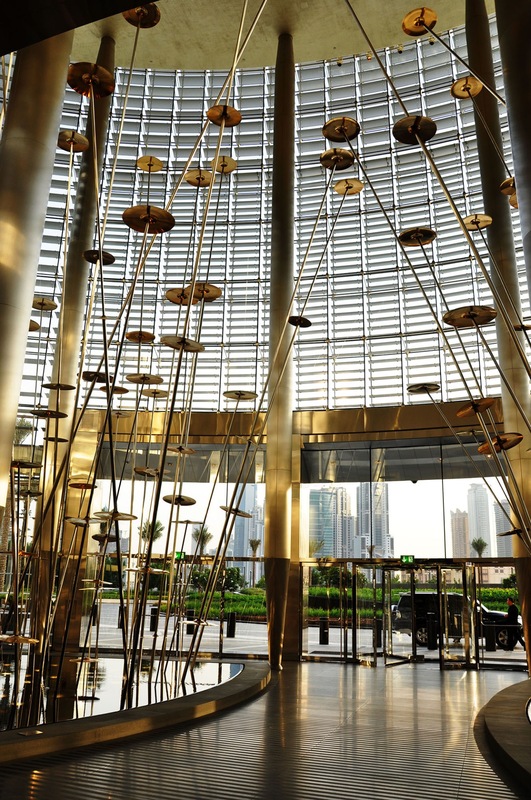 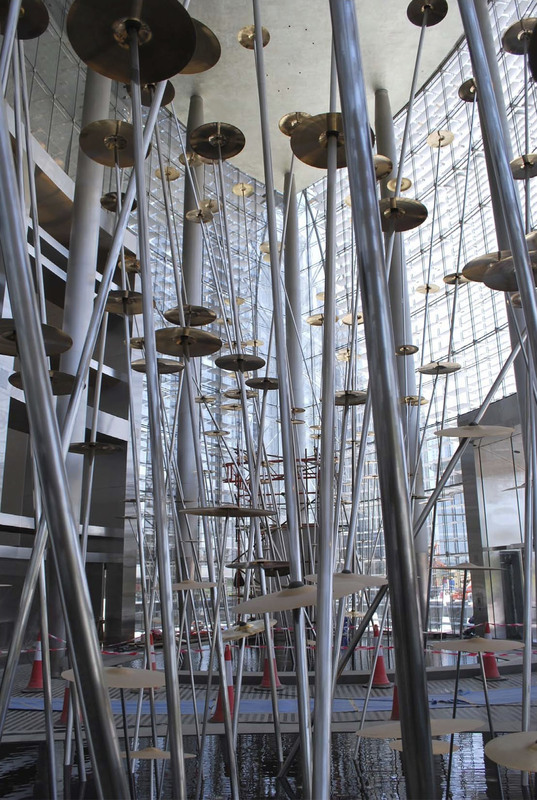 Burj Dubai’s architects and interior designers Skidmore, Owings & Merrill LLP (SOM) approached international and Middle East-based artists to submit concepts for the centrepiece of the Burj Dubai’s residential lobby more than a year ago. 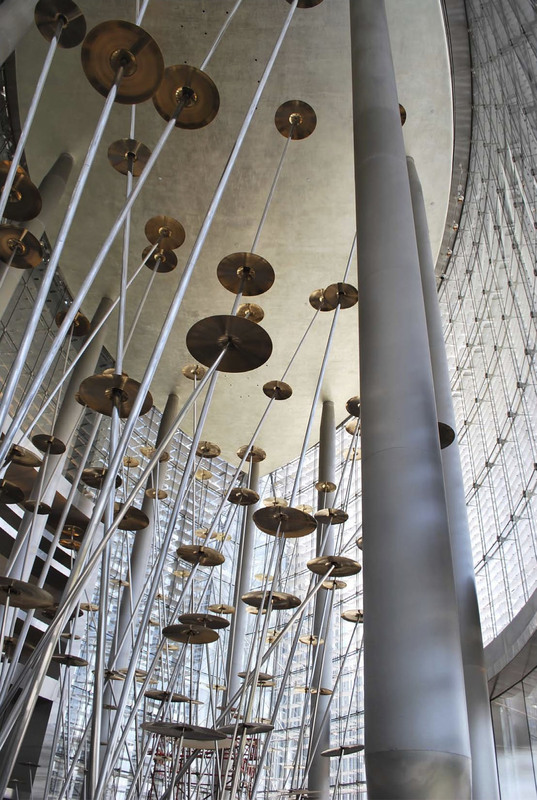 Plensa’s winning design was chosen from a shortlist of five. 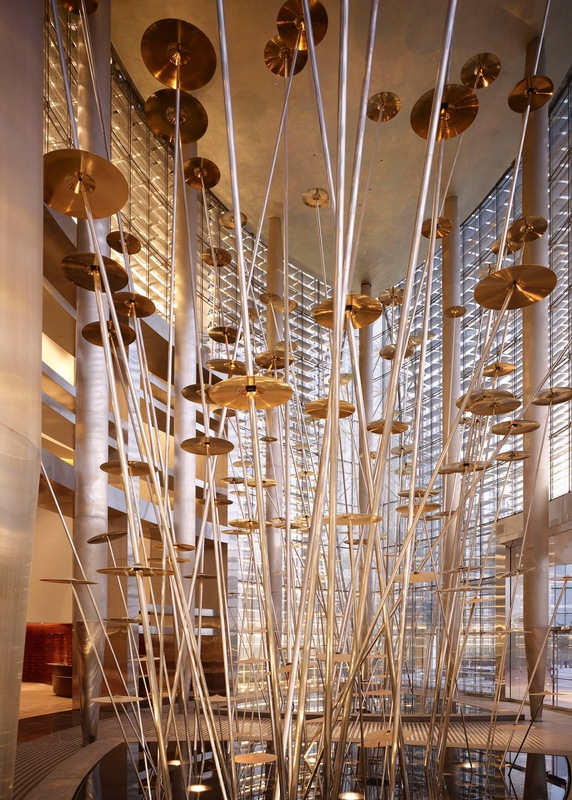 Even though Jaume Plensa designed World Voices, other contributors to this successful art masterpiece includes; Skidmore, Owings & Merrill LLP (SOM), Chicago, Galerie-Lelong, New York City, New York, USA, Crystal Fountains, Toronto, Canada and Fisher-Marantz, New York City, New York, USA. 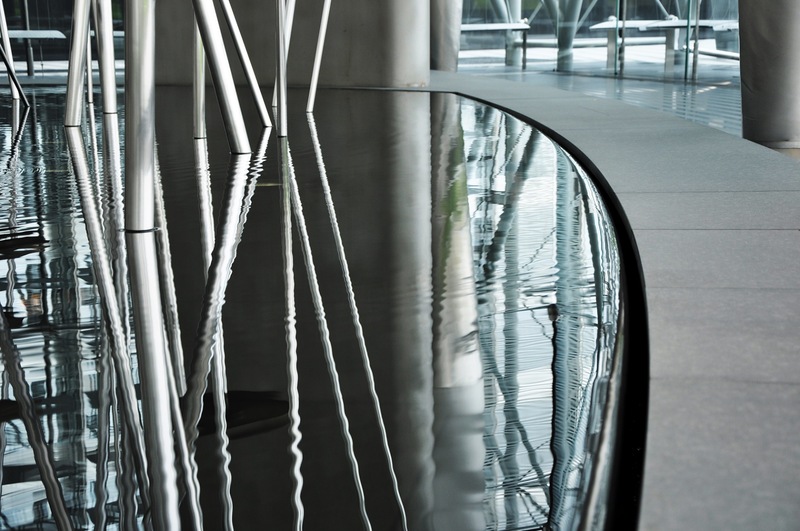 The Black Absolute stone used for the Residential Pavilion floor was quarried in Zimbabwe. 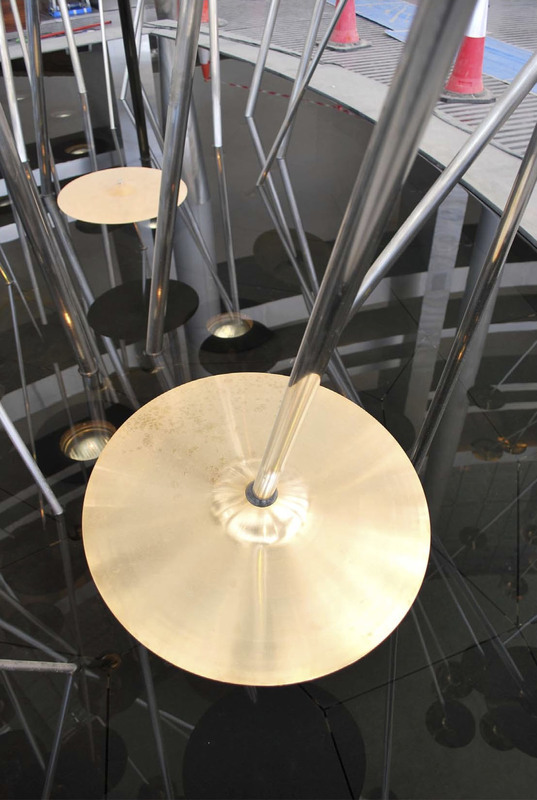 Pieces were cut and finished by the Marble Distributor Campologhni Italia, Montignoso, Italy.